Even with my limited math skills, I know that 10 is greater than three, so let’s start with the Red Rocks and Breanna Hughes’ perfect 10.0 on the floor, and finish up with the Runnin’ Utes’ third seed in the Big Dance. Last Saturday was Senior Night for the Red Rocks in honor of a trio of talented ladies — Kailah Delaney, Breanna Hughes and Kassandra Lopez. 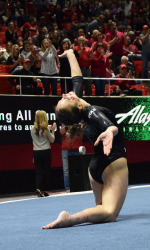 All three gymnasts have played key roles for Utah over the past four years, with a number of memorable performances by each of them, and big finishes in the season finale. However, even Disney could not have scripted a more appropriate ending to their final home meet of the regular season (all that was missing was the handsome prince, and if any of these ladies are still looking I have a son who is single). The meet featured a showdown between longstanding rivals in Utah’s Red Rocks and the Georgia Gym Dogs. Each team has claimed a record 10 national championships, and they have split their last 10 head-to-head match-ups. Consistent with such history, Saturday’s meet was hotly contested and required big time performances to carry the day. Breanna Hughes was perfect on the floor routine. Delaney stuck a big vault for a score of 9.85. Lopez had a career-tying high of 9.925 on the bars and a career-high 9.95 on the beam. Hughes won the all-around, but her floor exercise (the last performance of the meet) was the icing on the cake. The capacity crowd roared with approval throughout her routine. As she struck her final pose, the savvy fans rose to their feet with excitement knowing right away they had witnessed a special performance. The judges agreed, and much to the delight of the crowd, Hughes was awarded a perfect a 10. The 15,403 fans in attendance pushed Utah’s season attendance average to 14,928 for a new NCAA gymnastics record, and giving the Red Rocks their sixth all-sports women’s attendance title. Utah will compete in the Pac-12 Championships this Saturday, Mar. 19, where the Red Rocks, the two-time defending Pac-12 Champions, will be the No. 1 seed. Speaking of seeds, the Runnin’ Utes are the No. 3 seed in the Midwest Region, opening play in Denver on Thursday with tip-off projected to be approximately 5:30 p.m.
Utah has only been seeded higher in the NCAA Tournament a single time when it was given the No. 2 seed back in 1999. This is the third time the Runnin’ Utes have been seeded third, including its run to the title game in 1998. The NCAA Tournament is truly a special event among all sports, collegiate and professional, and it is hard for any other event to match the excitement that will surround these teams for the next three weeks. I know, I know, Oregon blew Utah’s doors off in the Pac-12 Championship Saturday night. However, the Ducks are also the No. 1 seed in the West Region. In fact, of the eight losses suffered by the Runnin’ Utes this year, only a single loss came at the hands of a team not in the NCAA Tournament — Stanford. Utah also lost to Oregon in the Pac-12 Tournament last year, but still made a run into the Sweet 16, then lost a hard-fought game to eventual champion Duke. Once again, the Runnin’ Utes are going to have to have a short memory and focus on the task at hand, and the immediate task at hand is Fresno State. Personally, I am thrilled with Utah’s draw in the Big Dance. It wasn’t that long ago when bracket predictions had the Runnin’ Utes playing far from home, making it a long road trip for faithful fans. Not only did Utah get a low seed, but they get to open play in Denver, which is a much more do-able road trip than, say, Providence or even Oklahoma City. Many fans will have already filled out their brackets before even reading this story, and realize that a ticket to the Sweet 16 will require victories over both Fresno State and the winner of Seton Hall and Gonzaga. The Runnin’ Utes’ path doesn’t get any easier after that as, barring an upset, they will have to play (and beat) No. 2 seed Michigan State and No. 1 seed Virginia. With a strong inside presence of Jakob Poeltl and Kyle Kuzman, combined with the sharp-shooting from the 3-point line provided by Brandon Taylor, Jordan Loveridge, Lorenzo Bonam, and Dakari Tucker, opposing teams are going to have to pick their poison as to how they are going to try and defend Utah. The Runnin’ Utes’ signature defense will give them a legitimate shot at winning any game, and if they can get three or four cylinders (players) clicking on offense then they can be very dangerous indeed. Notwithstanding Utah’s struggles with Oregon, I still think this team will at least match last year’s Sweet 16 performance, and has the potential to even take it one or two steps further. My own bracket has the Runnin’ Utes dancing into the Final Four (which, admittedly, is the result of a combination of an objective analysis of their strengths and weaknesses in relation to their anticipated opponents, as well as a good dose of emotion — but isn’t that what makes it fun?). Here’s hoping the Red Rocks pull off the hat trick with their third straight Pac-12 title, and the Runnin’ Utes dance their way into the Sweet 16.